Living room is also known as lounge room or sitting room. It is room for entertaining guests, other activities or reading. It should be spacious and well designed. It is main entrance for every house and must be presentable as well as pleasing. Always keep in mind that first impression is the last impression. Hence your living room speaks about your standard of living. 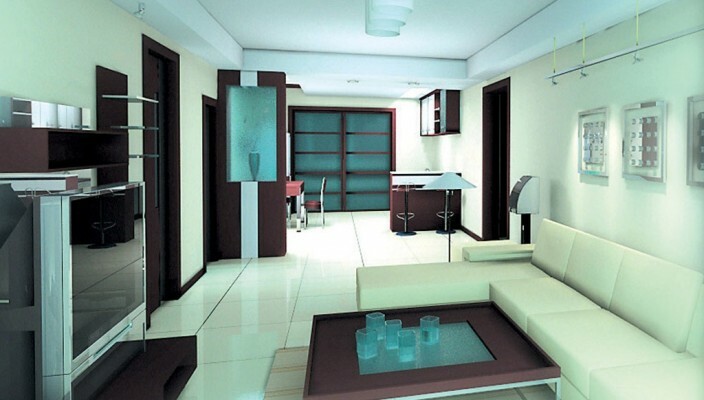 This design is perfect for studio apartment house. It utilizes maximum available space. Colors of furniture are contrast to colors of the wall. This design comes with light colors to make look room larger. Flooring is of marble, hence there is no need of extra carpet. A wooden stand is provided to put television set. Color of sofa set is similar to the colors of the walls. Here we provide wall stand for showcasing decorative items. Ceiling is provided with plaster of Paris work and delicate lighting lamps. A wooden panel separates your living room from the dining room.